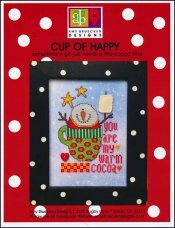 Cup Of Happy [G1867] - $8.00 : Yarn Tree, Your wholesale source for cross stitch supplies. Cross stitch pattern Amy Bruecken Designs. Everyone can use a cup of cocoa, even this cute snowman. Stitch count 64 x 84.